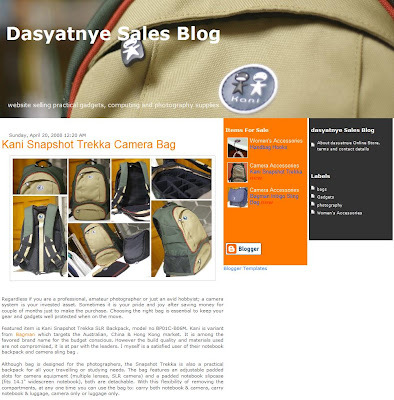 I am pleased to announce that dasyatnye.com now has a sister site Dasyatnye Sales Blog. This new site will focus on sales activity of practical gadgets, computing and photography accessories. All products on sale are from my personal collection, family or friends. Please drop by from time-to-time to see on the latest product on sale. hehehe.. best dah ada more places to go shopping online... yippiiee! heee..mcm nak chop initigo camera bag tu...KIV! This is my first comment for me wish he all the best. What a embllishing this blog is very nice.